Our customised novel luxury hand and face towels are soft on your skin and highly absorbent. This four-piece set of personalised microfibre hand towels and flannels useful at home, on holiday or even for sports. This bathroom towel set is custom printed in London. Using our online system you can quickly and easily design your very own four piece towel set made up of two hand towels and two flannels. Once you have decided on the design for your bathroom set it will be printed right here in our London HQ, packaged and sent right to your doorstep. Our custom wash towel set is a super fast way to give your bathroom the 'Wow' factor. Our Microfibre towels are perfect for every occasion, they are lightweight, quick drying and easily stored. Ideal for sports, holidays or at home. These personalised towels were a perfect gift for a gym loving friend and a thoughtful, humorous and well received present for someone that is notoriously hard to buy for . Quality is great and the website easy to use. The order was fast to arrive , this was a site I will definitely use again. As usually the quality is perfect and fast delivery. thank you so much again. 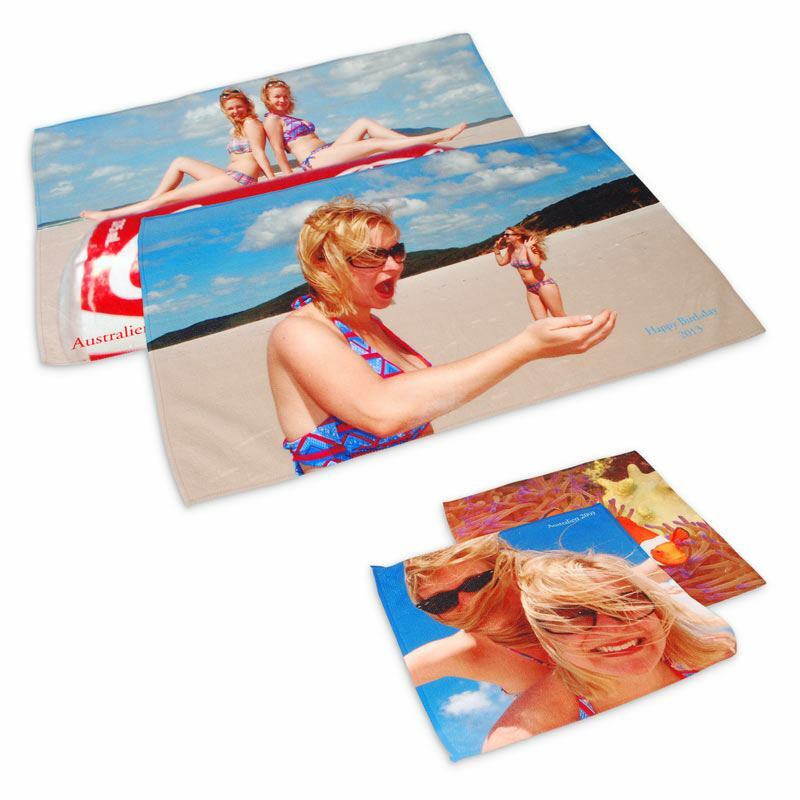 Your design is printed directly into the microfibre fabric ensuring that your image will not run, peel or crack. Due to the technical microfibre pile, small flecks of the white show on the face of the towel, this is common with all towelling fabrics. This extremely useful towel set is a great way to make your towels stand out. These hand and face towel sets include two hand towels and two face towels. Perfect for his and hers towels, or travel towels for that newlywed couple, or to celebrate an engagement. Personalise with a beautiful picture of the two of them and add their names to the towels. For wedding gifts, you could even add the date of the special day. These are also ideal if you have children, as you can make each set unique and reflect the personality of the child that it is for.